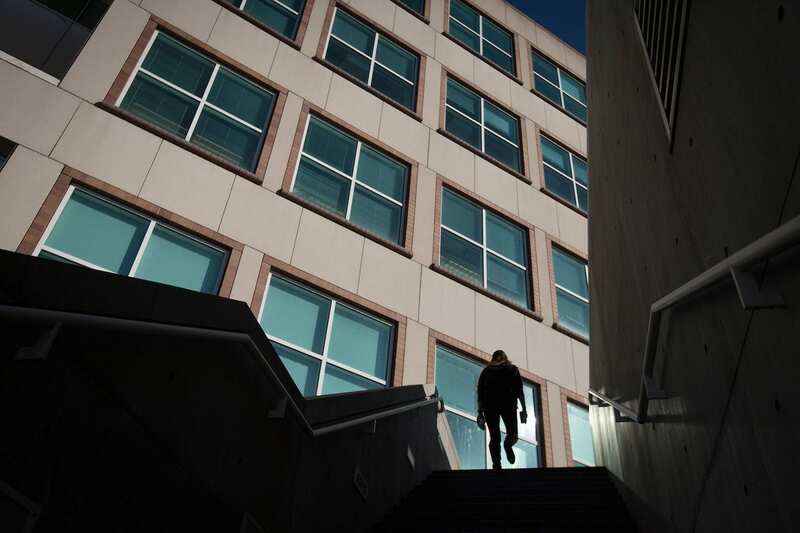 A student climbs the steps under the morning sun outside of the Biotechnology Building. Many specialized techniques central to modern life sciences research are best performed in shared facilities to minimize costs and improve productivity. Several facilities have been established at Cornell and are staffed by personal with expertise in those techniques. Facilities commonly used by GGD faculty and students are listed below. Center for Advanced Technology provides resources, information and real-life experience for those who seek to leverage their technology business idea into a small business. Center For Advanced Computing provides computational and data analysis solutions and information to the Cornell community and their collaborators. Cornell Statistical Consulting Unit is a professional service group that assists scholars in using statistical methods in their research in the most optimal way. Nanobiotechnology Center (NBTC) manages shared research facilities that promote interdisciplinary research by offering equipment, capabilities and training for nanobiotechnology researchers. Cornell NanoScale Science & Technology Facility (CNF) is a national user facility that supports a broad range of nanoscale science and technology projects, providing state-of-the-art resources coupled with expert staff support. Cornell Center for Animal Resources and Education (CARE) provides services and a resources to the AAALAC accredited Cornell research and teaching community, providing high quality animal care, promoting best practices for responsible animal care, as well as advice and education on animal experimentation issues. Cornell Stem Cell and Transgenic Core Facility offers services to Cornell researchers related to the generation and utilization of ES and iPS cells, as well as CRISPR genome editing. Plant Tissue Culture and Transformation Facility is a service facility which makes transgenic plants of time-consuming or hard-to-transform species (focusing on NYS crops) in support of plant biology researchers. Resource for Biophysical Imaging Optoelectronics focuses on the creation and optimization of quantitative optical instrumentation for biophysical and biomedical research, specifically multiphoton laser-scanning microscopy for biological research and biomedical imaging. Macromolecular Diffraction Facility at CHESS (MacCHESS) provides a facility for developing new technology and for advancing the research goals of structural biologists as well as the broader biological research community.